Semmelknödel are tennis ball sized dumplings made of bread, eggs, onions, milk, and various seasonsings. Bread cubes, eggs, onions, and milk. They are boiled in water. Breznknödel use pretzels as the bread. Schinkenknödel also include ham. 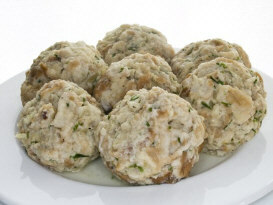 Semmelknödel go well with a pork roast, Sauerkraut, and lentil and mushroom dishes. They also go very well in a meat soup. Leftover dumplings can be easily reheated. Slice them in half, then in a frying pan with some melted butter, fry them until a crispy crust form. A traditional dish adds an egg to the pan and scrambles the egg with the dumplings. This is served with a salad for a light meal. The Bavarians are credited with the invention of the Semmelknödel. It was a popular and loved dish already in the Middle Ages. It was an excellent way to use old bread, which was too expensive to throw away.